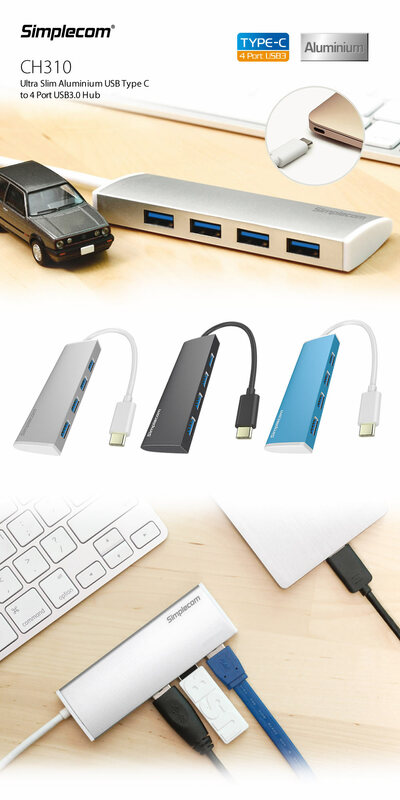 Simplecom USB Type C to 4 Port USB 3.0 Hub makes a perfect companion with laptop using USB Type C interface. The slim and lightweight design makes this hub an ideal travel companion to expand one USB Type C port into four USB 3.0 ports. Especially designed for laptops with Aluminium Casing and built-in cable. This Type C hub add up to 4 USB devices quickly and easily, such as a printer, card reader, pen drive, mouse, keyboard*, or an external hard drive^. * 2.4Ghz wireless devices, such as wireless keyboard and mouse adapters, may not work in USB 3.0 port. Connecting to a USB 2.0 port is recommended. ^ For a stable connection, the devices connected to the 4-Port USB 3.0 Hub must not exceed a combined current of 5 volts 900 mAh. External hard drives should be connected to an external power source if needed.